One of the things that i love about some of these fantasy series that i’ve been reading is when there’s a book 1.5 or a .5 to read while we’re waiting for the next installment to come along. 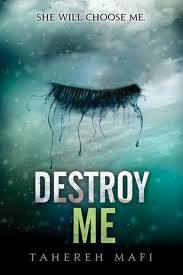 Destroy Me is just that – the semi-sequel to Shatter Me that kind of ties us over until Unravel Me comes out. So in this short story, we’re in Warner’s head – after he’s lost Juliette to Kent and Kishimoto and well, he’s devastated. He can’t help but think about her all the time, not because he’s lost some of his power and authority due to being injured while she escaped, and disappointing his father who’s the supreme leader, but because he’s actually convinced himself that he loves her. that will always get a man into trouble. so we’re in Warner’s head for a bit – experiencing his weaknesses as he’s healing and trying to figure out what’s happened to Juliette and how to get her back. to be honest, there wasn’t too much development behind this story, but what we do learn is that his father knows that Juliette isn’t alone in what she is…and you have to wonder if it’s because he knows that maybe his son is like that too? i seem to remember that there was a scene in Shatter Me where Warner was touched by Juliette and nothing bad happened to him while she shocked and harmed everyone else that touched him. just a thought. so i guess we have to wait until Unravel Me comes out to see if Warner’s imagination is getting the best of him or if he’s on the cusp of accomplishing more and finding more than he hoped. This entry was posted in fantasy, Reviews and tagged Destroy Me, Shatter Me, tahereh mafi by iscm13. Bookmark the permalink. I simply want to say I am just newbie to blogs and actually liked this blog site. Very likely I’m going to bookmark your blog . You definitely have perfect articles and reviews. Thanks a lot for sharing your website. Thank you so much for the kind words. I’m glad that you enjoy my reviews and I hope that I can continue to provide you with content that you find entertaining. I just want to mention I’m beginner to blogging and site-building and actually enjoyed your web blog. Almost certainly I’m going to bookmark your blog . You really come with superb stories. Thanks for sharing your webpage.